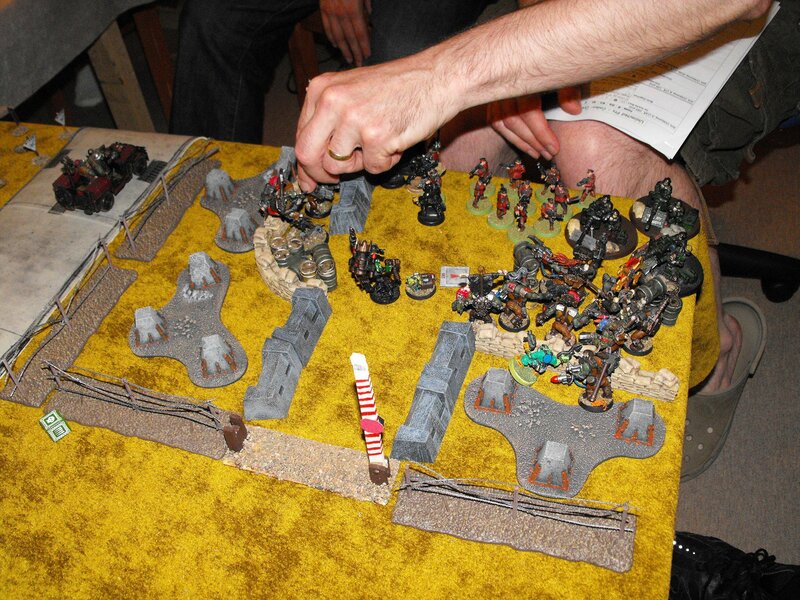 In memory of all the Greenskins who perished on the sands of Swaaarghrd Beach, we present the following pictoral tribute (photos all courtesy of Jason, who documented the game when not slaughtering Orks). 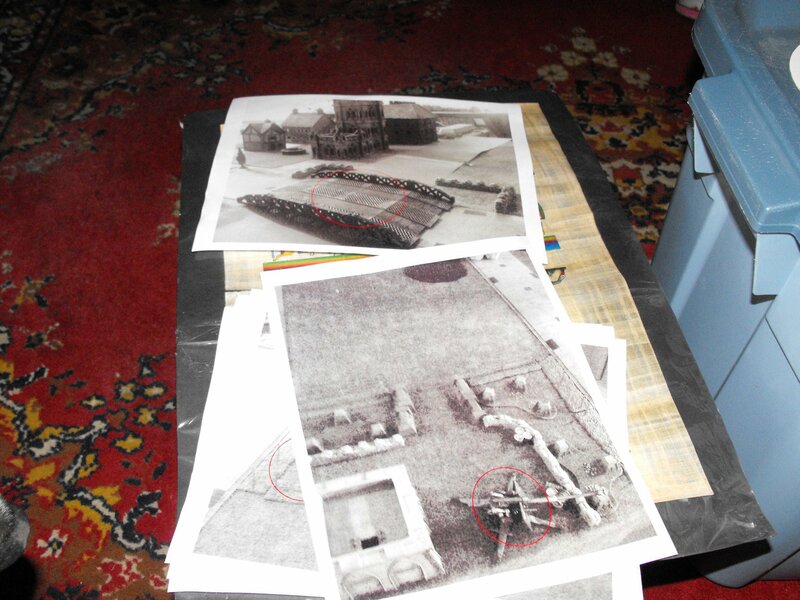 One key objective was the gun battery at Squigville, which overlooked Swaaarghrd Beach. 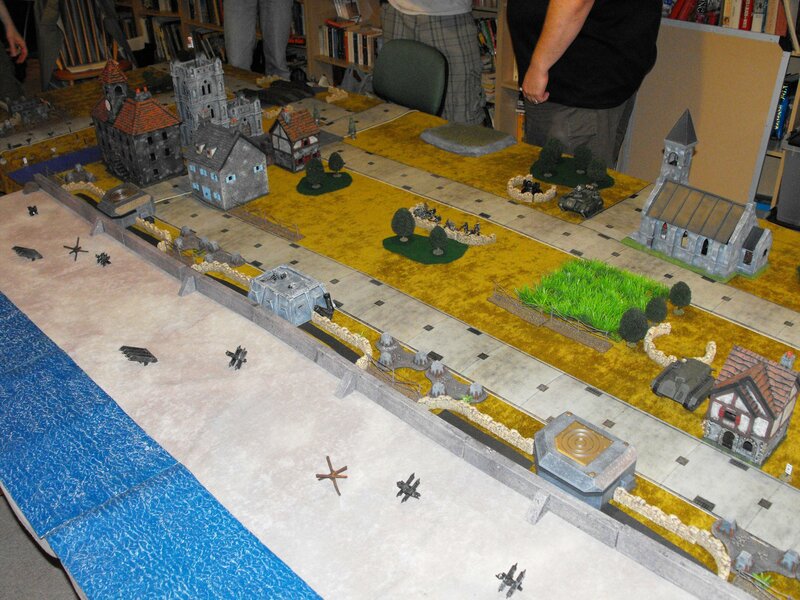 The landings would face beach obstacles, a high seawall, bunkers, tank traps, trenches, barbed wire, and minefields—as well as the remarkably numerous 716th Imperial Guard. 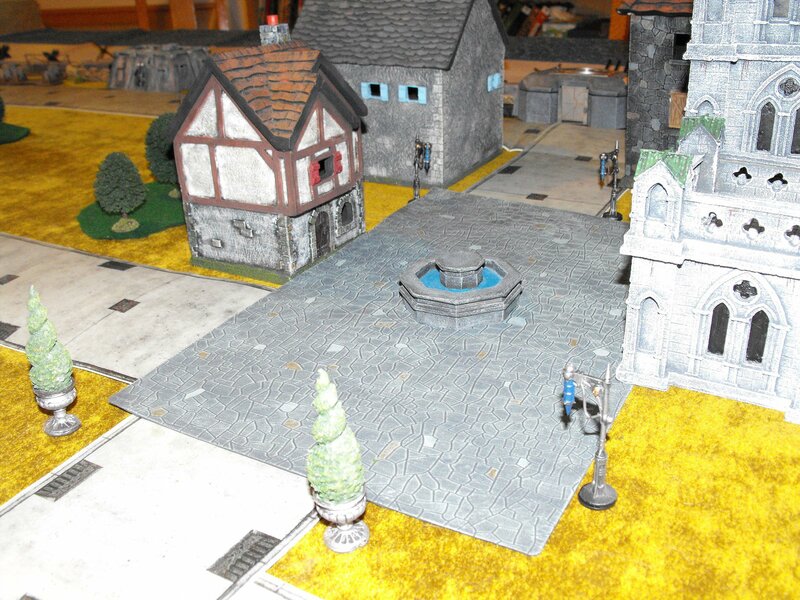 The woods and fields of the Orkandy countryside looked deceptively quiet. The allies hoped to capture the coastal town of Orkeham. Although the approaches to the town (Sector Mork) were held by formidable fortifications. 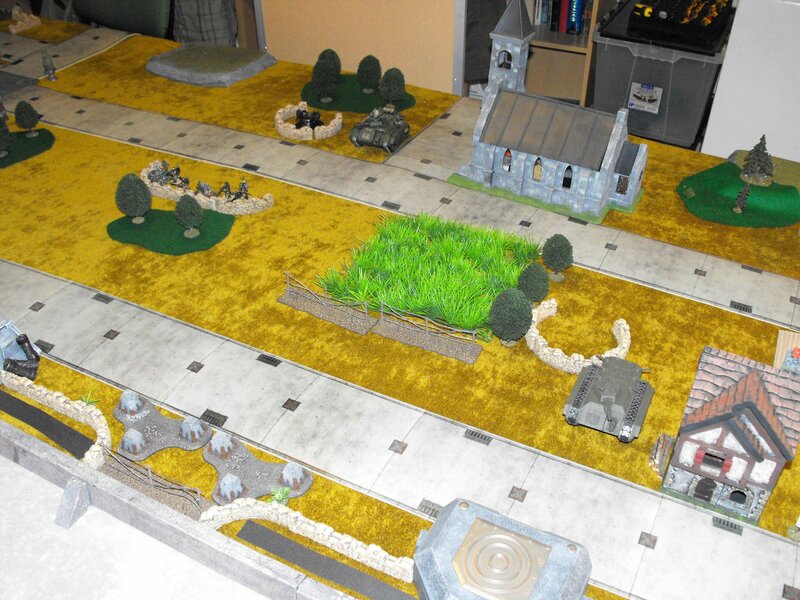 The initial night-time landings by the 6th Orkborne Division went well. Heavy AA fire would mean that one unit of Stormboyz were dropped far from their intended DZ, but in the best Orkborne tradition they marched towards the sound of the dakka and arrived only a little late. 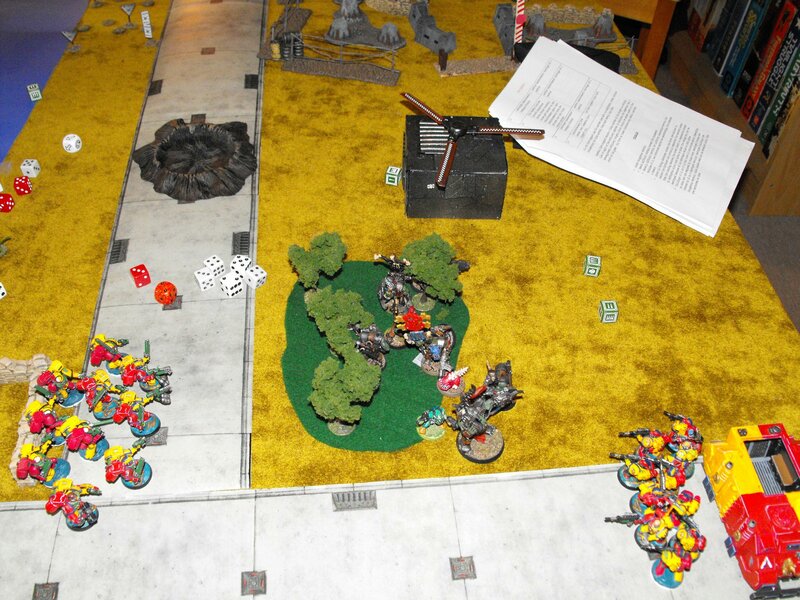 The Stormboyz and Glida Nobz assaulted the defences, destroying the guns, the bastion, and the squishy pink hummies inside. 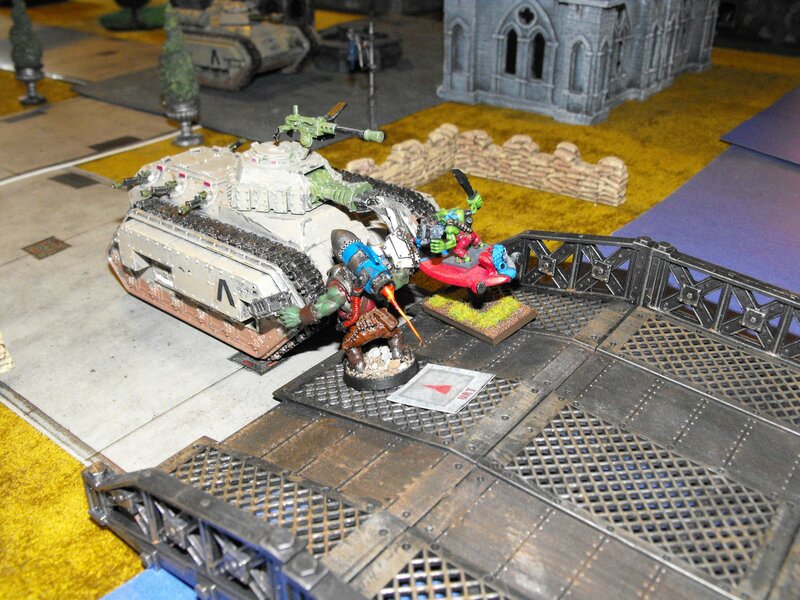 Warboss Sean and his paraNobz took point-blank fire from three Imperial Autocannon and an infantry squad without casualty, thanks to the effective work of their Painboy. 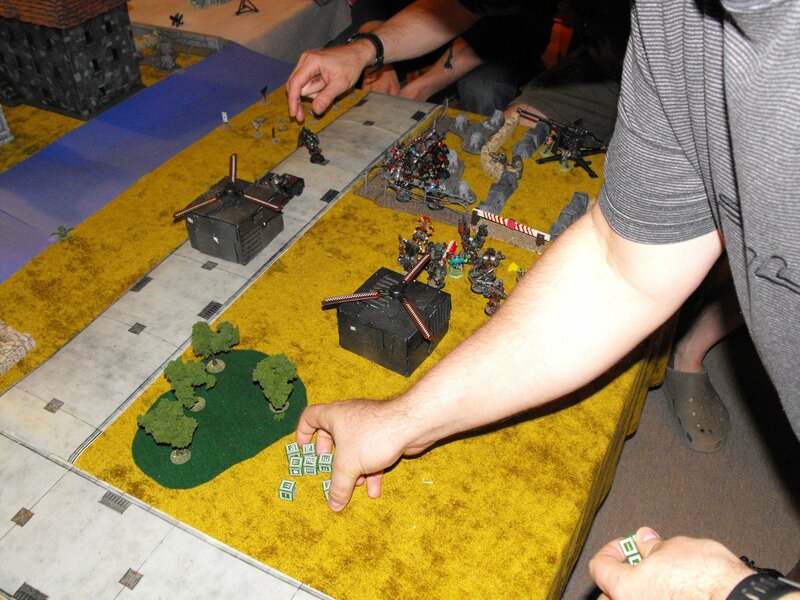 Unfortunately the Stormboyz accidentally detonated a crate of ammunition while destroying the gun, suffering heavy casualties in the resulting explosion. 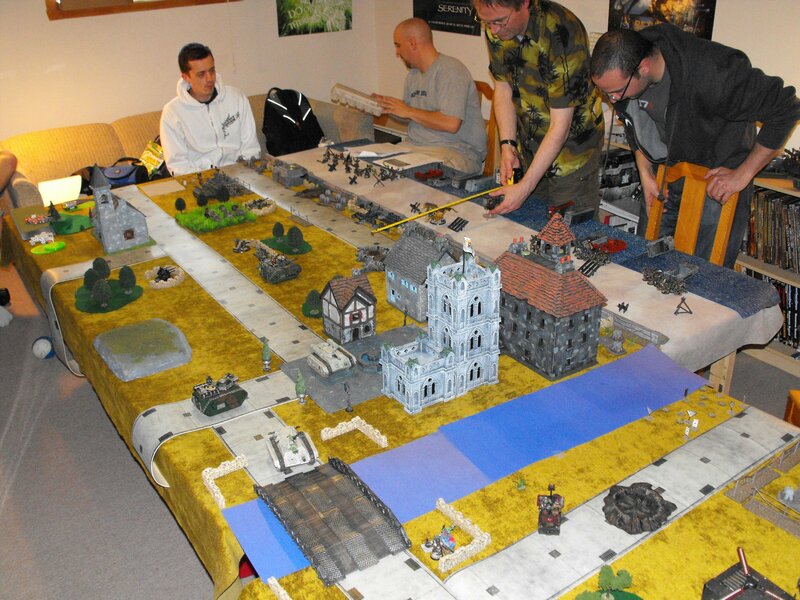 And as dawn rose, the 6th Orkborne were pressing on to capture the strategic Wyvern Bridge. If they could hold it, they might block any counterattack by the 21st Space marines from reaching the invasion beaches. 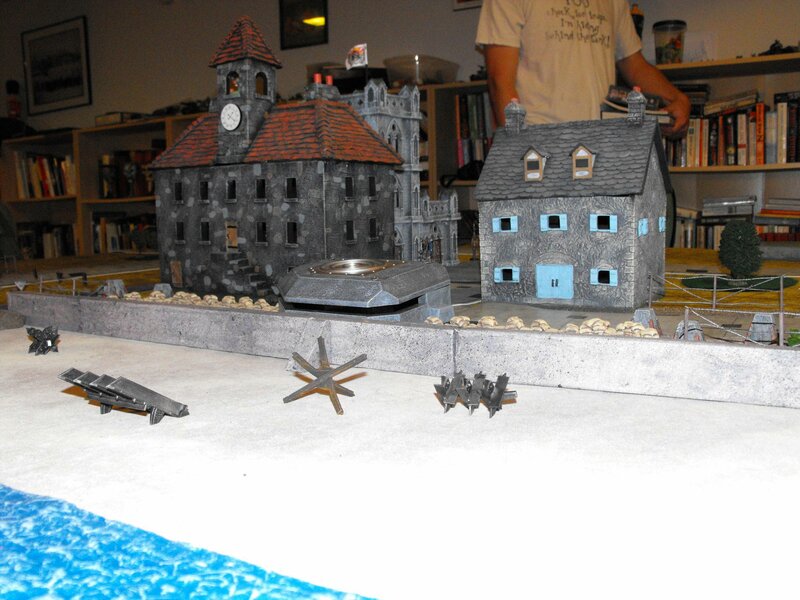 The initial Firestorm destroyed both the central bunker, and a house in Fungus-sur-Mer containing an Imperial commander (who escaped the barrage). 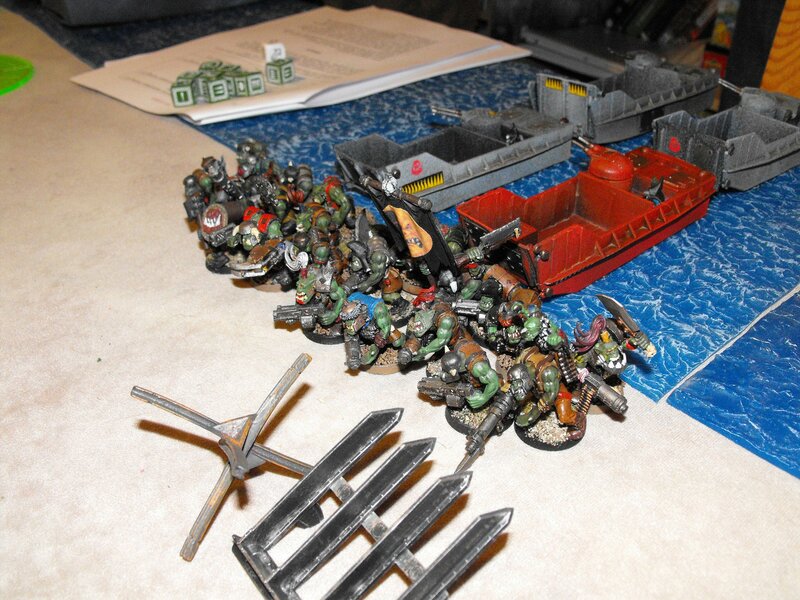 Unfortunately, the landings did not go as planned: two-thirds of the first wave was sunk at sea by Imperial Guard heavy weapons fire, leaving only a limited number of Boyz to storm the beaches. Being Boyz, however, they Waaagh-ed forward regardless, plunging headlong into the withering fire of massed Imperial Guard troops. The second wave arrived, but more than half of its boats would be sunk too—including all the Greenskin heavy armour. 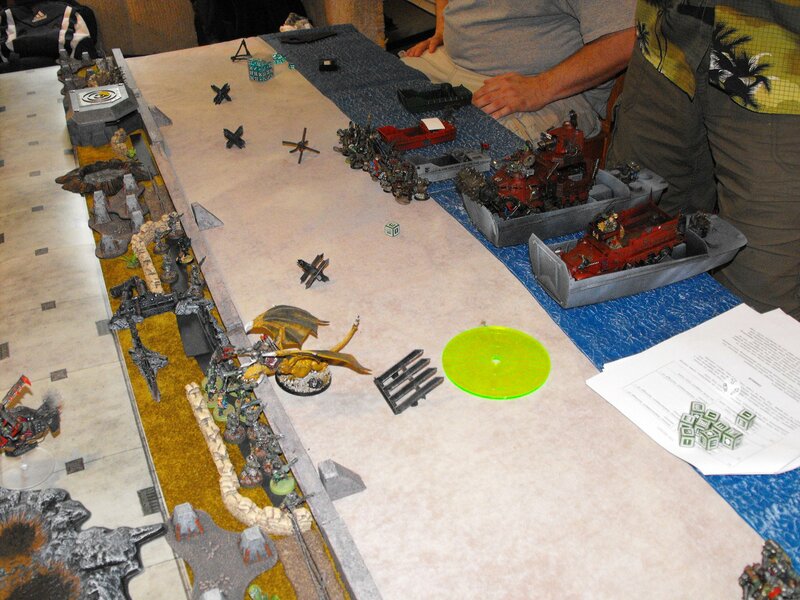 Mobz of Kommandoz and Tankbustas did make it ashore, and ran forward up the beach. Some of the Boyz even made it up and over the wall. Bunkers were ripped apart, and those unfortunately Impies who remained in the trenches were slaughtered. 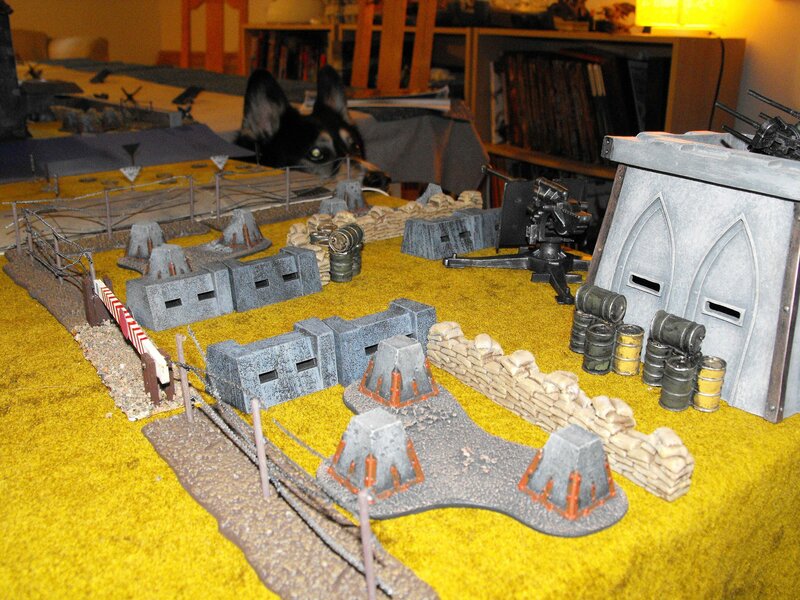 The 6th Orkborne, having captured Wyvern Bridge, waited for the inevitable counter-attacks. They weren’t long in coming. 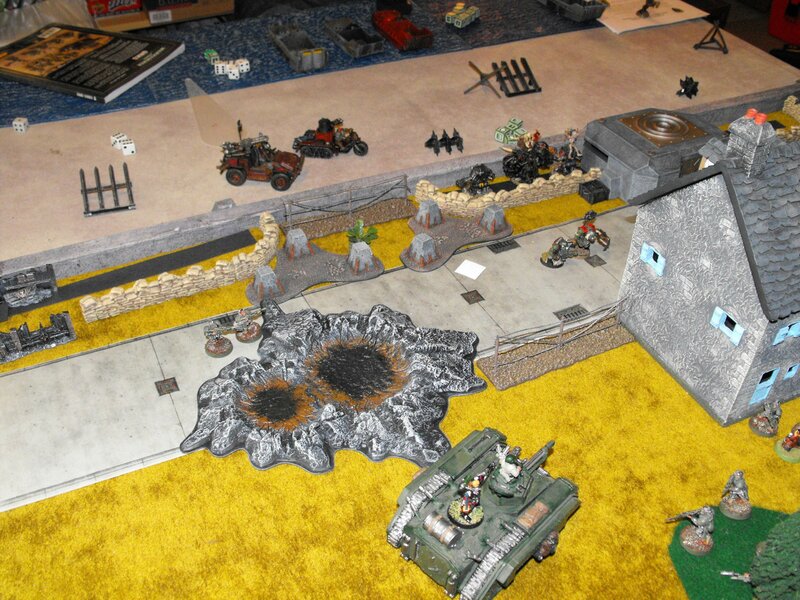 First Imperial Guard and then Space Marine reinforcements moved against them. The 6th Orkborne fought valiantly, but would eventually be overcome. 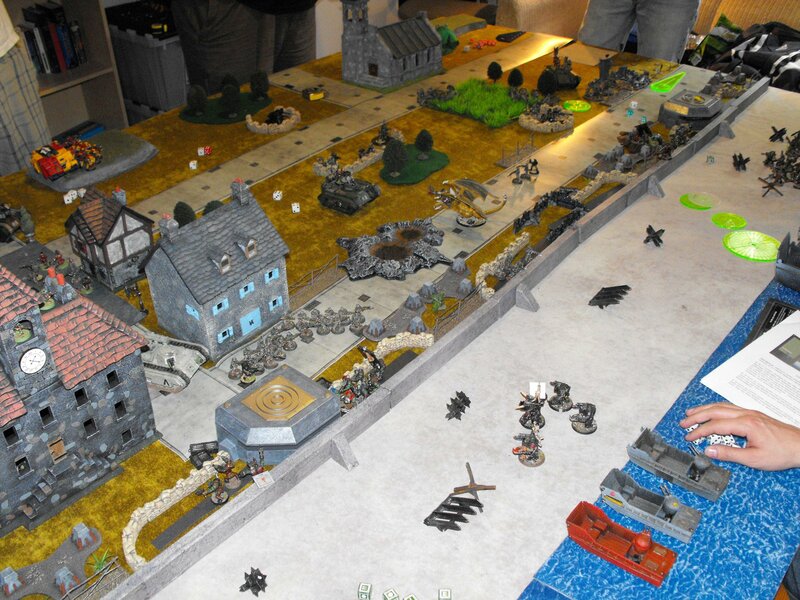 At Orkeham the Imperial Guard counterattacked too, trying to push the Orks back into the sea. 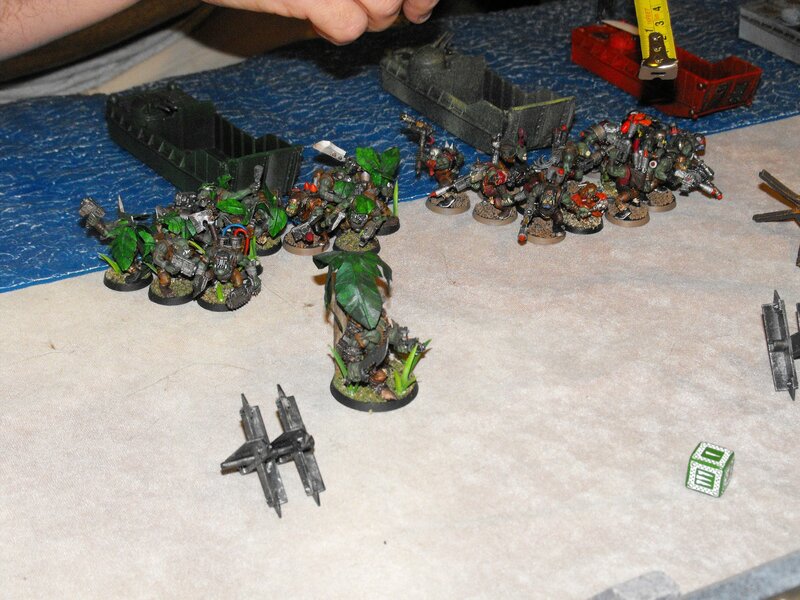 The Ork leadership fought to the bitter end. 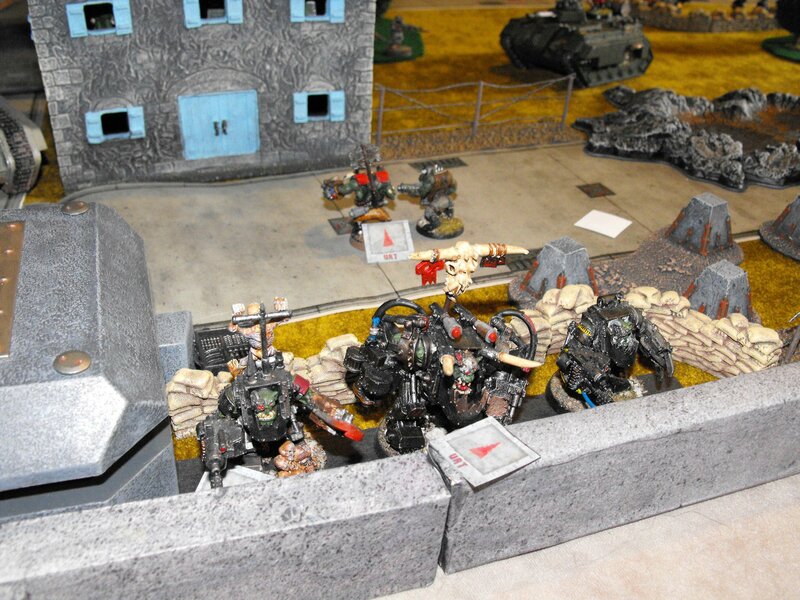 Here Warboss Vince and a small group of MegaNobz prepare to rip a hole in the seawall. 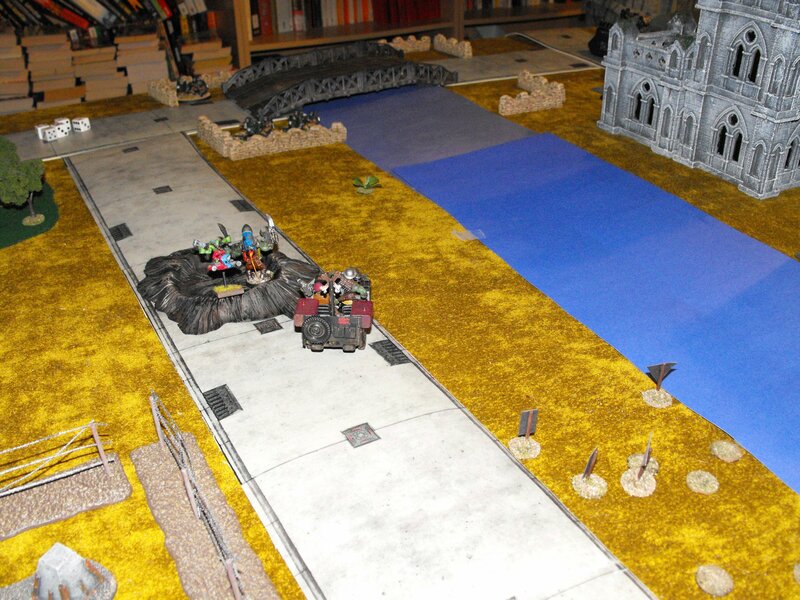 There aren’t many surviving Orks to exit the beach, but dammit it was one of the objectives and they’re damn well going to do it. To the East, Mad Doc Daryl would lead his rapidly dwindling group of Boyz on a destructive rampage, until finally brought down by a closing ring of Imperial steel. Warboss Rex, who never made it ashore, would wish he taken swimming lessons (or that KFF generators floated). what a nice AAR! well done.